Ferulic acid isolated from Tetragonia tetragonioides was tested for its whitening effect on the B16F10 mouse melanoma cell line and its anti-wrinkle activity on the CCD-986sk human dermal fibroblast cell line. Ferulic acid, one of the primary phenolic compounds that can be isolated from T. tetragonioides, has been reported to show potential as a functional food, for its whitening effect and anti-wrinkle activity. To measure its whitening and anti-wrinkle activities, cells were treated with ferulic acid isolated from T. tetragonioides at concentrations between 5 and 20 μM. Ferulic acid showed no cytotoxicity at concentrations up to 20 μM. Ferulic acid inhibited melanin synthesis, tyrosinase expression, and microphthalmia transcription factor expression in B16F10 cells stimulated with α-melanocyte stimulating hormone. Ferulic acid induced procollagen synthesis, hyaluronic acid synthesis, tissue inhibitor of metalloproteinase synthesis, and inhibited matrix metalloproteinase (MMP)-1 and MMP-9 expression in CCD-986sk cells stimulated with UV-B. 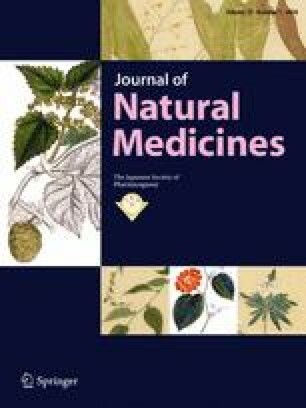 On the basis of these results, we conclude that ferulic acid isolated from T. tetragonioides shows potential for use as a functional food, with whitening and anti-wrinkle activities. Hye-Jin Park and Jun-Hyo Cho contributed equally to this work.